What do you see when you look at a glass of wine. To the trained eye it tells a whole story. It may relieve if a wine is young or ages, if chardonnay ,for example is oaked or unoaked. I can even tell you the flavours you can expect! Many people thing that wine has only two colours Red and White. In fact the juice of a grape is white. The red colour comes from allowing the grapes skin to contact the juice. The color of the wine depends on the method of vinification and the time the must is in contact with those skins, a process called maceration. The Teinturier grape is an exception in that it also has a pigmented pulp. The blending of two or more varieties of grapes can explain the color of certain wines, like the addition of Rubired to intensify redness. There are numerous colour charts available that can help you identify the wines and their characteristics For example “buttery” Chardonnays usually a rich gold color. Unoaked Chardonnay has a pale yellow colour. Colour can tell you if a wine is high or low in Acidity and tannins. Oak can also help make colors lighter or darker, so understanding color, especially for white wines, can help people who don’t like oaky white wines avoid them. Light and bright white wines that you can see through have had minimal contact with the grape skins and are usually crisp and refreshing, like lemonade on a hot summer day. Typically, these wines have not been aged in an oak barrel. f the wine is darker and deeper in yellow, then this is usually a good sign that the wine was aged in an oak barrel. It will have a smoother taste and will be much fuller and richer. Darker, bolder, richer reds are usually aged in Oak. They go good with steak. The color of wine indicates age, grape variety, density of flavor, acidity and more. By comparing the different colors found in various red wines you can learn to identify a wine just by looking at it. 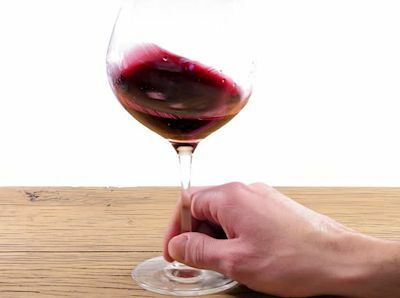 Merlot tends to be slightly lighter in color than cabernet sauvignon but it also has a special indicator that you can almost always pick out on a younger wine. It has slightly orange tones on the rim. Light-bodied white wines like sauvignon blanc and pinot grigio should be clear with a very pale, light yellow color which indicates the wine is fresh, vibrant and ready to drink. Charles Spence, who leads the Crossmodal Research Laboratory at the University of Oxford, agrees that color and other sensory phenomena can prime our brains for flavor, setting expectations about the taste that anchor our experiences when we’re actually eating and drinking.